When migrating an existing website to a new website, you will need to export the data from the older website and import it into the new website. Order/Coupon/Subscription Export Import Plugin for WooCommerce will help you easily import and export all the orders and order metadata with great ease. Using the plugin you can easily migrate hundreds or even thousands of orders and order data between WooCommerce websites. You can even easily import the order data from other e-commerce platforms as well. To know all about the plugin and its features visit the product page of the plugin. When exporting and importing orders, special care has to be taken since orders are linked with WooCommerce data like users, products, etc. These data may be connected using their corresponding IDs. When you are migrating the orders to the new site, you will need to move all the other data like users, products, coupons etc. So make sure to import all the data that are linked to the orders before importing the orders. The relationship between the orders and other post types are established when the import takes place when using the Order/Coupon/Subscription Export Import Plugin for WooCommerce. So, you have to make sure that all the related post types are already present or added to the new website. To export the orders from your existing WooCommerce store to a CSV or XML file, go to the admin side of the website. From the WordPress dashboard, navigate to WooCommerce > Order Im-Ex. This will take you to the plugin page. Now go to the Export Orders in CSV/XML format section. Using this plugin you can export the orders to either a CSV file or an XML file. Let us export the orders into a CSV file in this example. Now that you have your CSV at hand, you can now proceed to import the file with orders and order data in the new WooCommerce website. You can import orders from CSV file or merge the orders with already existing orders by importing updated CSV file. Select the checkbox to create a new user, if the user corresponding to an order is not found in the store while exporting. 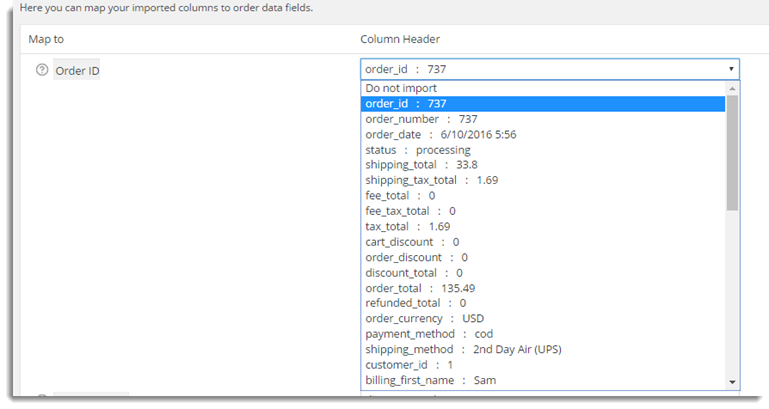 You can map the fields(Woocommerce fields) with column headings ( CSV file header). 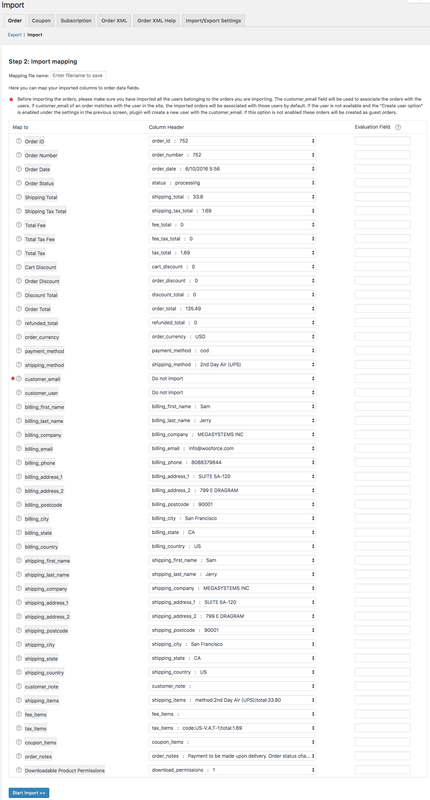 Map a particular field of Map to column by using Column header drop-down list as shown below: Select the required option from the drop-down list. Here, Order ID is mapped to order_id.Note: Mapping is very helpful if you are importing CSV from some other e-Commerce platform like Magento. Note: Hover the mouse on ‘?’ (Help), you can see the information about Evaluation field. 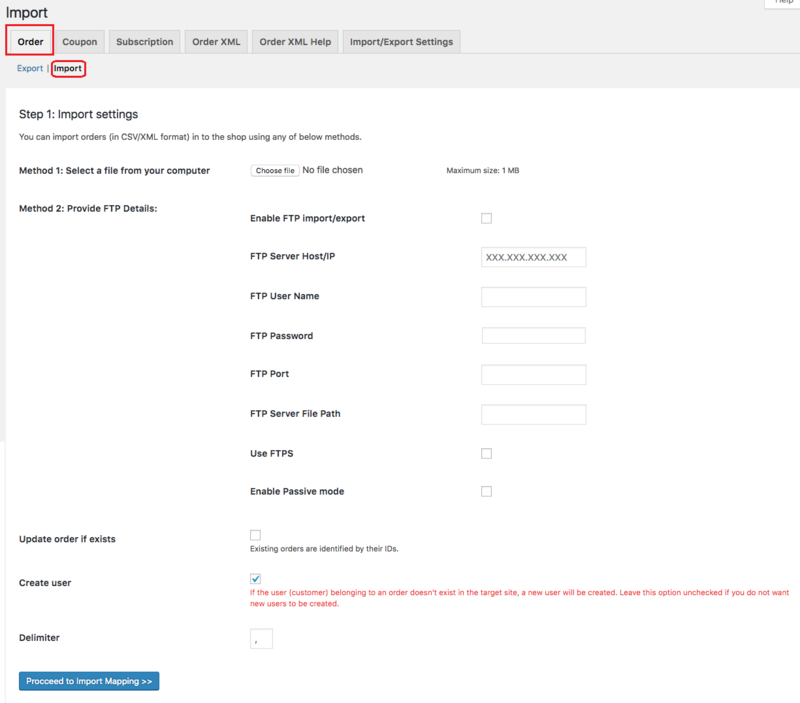 For more information on Evaluation field, See Evaluation field in Order Export Import Plugin for WooCommerce article. According to CSV file, the order(s) gets added to your online store. The import window appears as shown below: While importing orders with the applied coupon, the plugin connects coupon if the same coupon exists in the online store.